In this voluntary project, Kedmor collaborated with Architecture students from the Bezalel Academy of Art & Design, to create a temporary pavilion for the entrance of the Architecture department. The project focused on the exploration of natural materials with algorithmic design procedures and digital fabrication. The students elected to create a sustainable structure, using form-finding parametric modelling techniques. They used Grasshopper and Rhino to optimize the structure to maximise the shadow created on the ground. The structure, built by the students, was formed from natural timber and locally sourced from the Jerusalem Municipality. 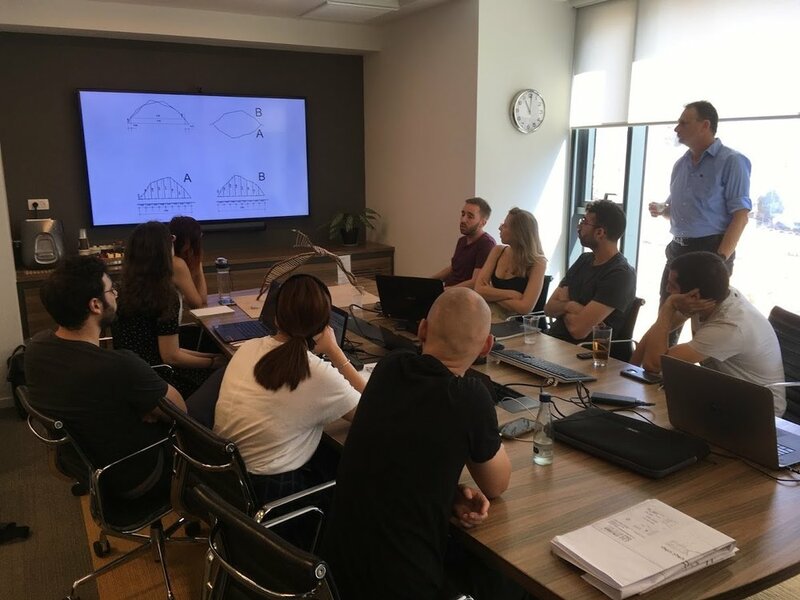 Kedmor provided the engineering support for the project, using finite element analysis software and engineering know-how to stabilise the structure and resolve issues along the way, in cooperation with the students. This project was supported by Casali Institute for Applied Chemistry, Negev Ecology and Nesher Cement industries.